Why we bought this motorhome? We bought "Homer" in April 2014 with only 13,700 miles on the clock. 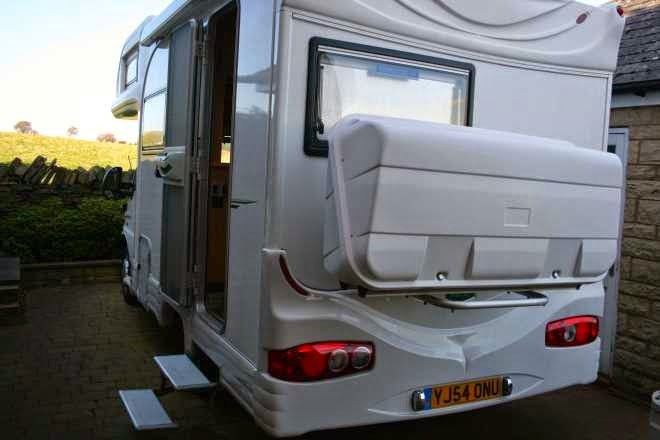 She had been bought from new by the couple selling her and was in fantastic condition for a 9.5 year old motorhome. She had been regularly serviced bi-annually. We hadn't originally planned to go motorhome touring. It was only after a health scare forced us to change our plans from a walk tour, that we had a few weeks to gather some advice from buying guides, set a budget, think about some key features we would like, research the internet and eventually select a few motorhomes to go and view. We've written a series of articles about our experiences buying our first motorhome which you can read here but in short, because we had never travelled in a motorhome before we didn't expected to find the 'perfect' motorhome for us the first time round so instead our main criteria were reliability and finding a good deal. The only feature which was essential was a bathroom because of Dan's health issues. For our first, we wanted a compact motorhome less than 6 meters in length - mainly for drivability but also because of potential additional ferry or toll costs on the continent. We viewed 3 other motorhomes before this one - a Possl van conversion, an Autocruise Vista and a 2-berth Autocruise Starfire. 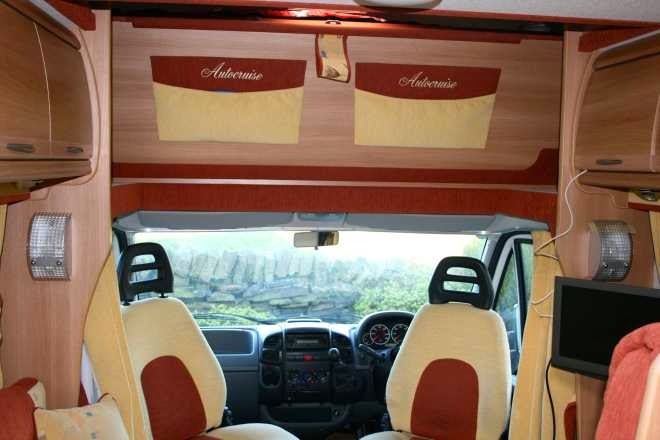 At the time we steered away from a van conversion as we wanted the extra space that a coachbuilt offered. The Autocruise range stood out to us in terms design and features. At the time, we felt the Vista was a little too small for a longer trip and liked the Starfire - however the 2-berth model we viewed had several mechanical problems so was ruled out. 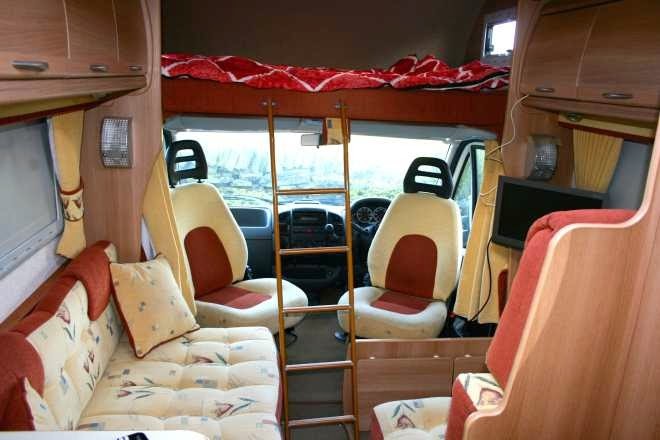 We never considered a motorhome with an over cab bed as they tended to be much bigger, however it was only because this particular compact 4-berth became available when it did that we decided to see how it felt. Once inside we immediately appreciated the extra space and headroom in the front of the habitation that this model offered plus liked the idea of not having to build the bed. Also should people join us on our trip we could offer road legal seating for passengers and somewhere to sleep. At the same time during the test drive we still found it very easy to drive as the motorhome was still so compact, not noticing the extra volume above the cab. Where we've been in this motorhome? In short we have driven 13,200 miles in just under two years and mostly in Europe. Homer has been great on long motorway drives, down country lanes and up some of the biggest mountain passes of the French and Swiss Alps. Browsing this blog will show you the places we have been (you can see our route here - some updating is still needed). Although on some occasions the engine was a little underpowered (a 2L engine on a 3.5 tonne van struggled a little with long drags and steep mountain roads) and on some other occasions the size was a little bulky for very small mountain roads with overhangs which required caution but on the whole there was no were no places that we didn't go because the motorhome couldn't take us there. Engine: As soon as we bought the motorhome we had the cam belt replaced. Although it fell far short of the mileage requirement, the engine was 10 years old. But other than the annual service, this was the only work we had done on the engine in the 2 years of ownership. Habitation: We also didn't have any no major problems in the habitation either. Some very small wear and tear replacements - the catch on the fridge door, hinge on the freezer compartment, 2x light bulbs, 2x fly screens on the roof hatches replaced, a small overflow valve on the water heater, switch in the bathroom lights. Total cost of these repairs was less than £150. We also had an extra Thule lock fitted to the habitation door for additional security which cost £60 fitted. Being only 5.5 metres in length has made this motorhome very easy to drive motorhome as she is so compact. Parking has also been pretty straightforward as she fitted into most standard parking bays pretty well. And we have benefited from staying in the cheaper class of vehicles on ferries and toll roads. We enjoyed having a big bathroom with a separate shower cubicle, not only for showering etc. but as a convenient place for laundry, damp kit and changing on rainy days. The way that Autocruise had designed the bathroom needs a special mention. The sink was on a hinged wall panel that swung out to leave a full sized shower cubicle behind it, that was closed off with a small frosted panel. This meant that the bathroom was an excellent size when not using the shower and that only the shower tray got wet rather than the whole room when showering, making it a very large versatile bathroom in a compact motorhome. Having an option to for two sleeping areas was brilliant. Not only could we have a double bed either over the cab or downstairs, but on very hot nights in Summer when it could get a bit too stuffy in the overcab area for two we had the option to make up a single bed downstairs very easily (comprised of the side bench and passenger seat). Having an overcab bed meant we didn't need to build a bed or put it away every day saving a lot of time. It also meant that we could leave the driving seats in position and easy to access whilst we were asleep so that we could get moving early or in case we had to move on suddenly in the night (which we never had to do but it was reassuring). The volume of storage was more than enough. The cupboards had been well thought out, there was a large space under both seating areas, an under floor storage accessed from within the motorhome and even a wine cupboard! The fridge was a decent size for a compact motorhome with a reasonable freezer compartment. The quality of the Autocruise finish and build was superb - very robust and sturdy. Visitors to our motorhome often commented on the rounding and aesthetics in the habitation which made it "feel very homely rather than box-like". We feel we must mention the free-standing and collapsible dining table was very versatile. It could be positioned in various ways for dining or even taken outside. It was also very useful that it had it's own stowaway cupboard for travelling and for when it wasn't needed - again maximising the living space day to day. Some compact motorhomes we saw only had one seat which could turn so it was really good that both the driver and the passenger front seats were 'captains chairs' that we could turn around, creating a lot more living and entertaining space. Most of the features that weren't for us were because they were surplus to our requirements rather than actual problems. We didn't need the full oven, the grill or 4 gas rings. Many people we met said they couldn't be without the oven (and it was a feature the couple who we bought Homer from appreciated and also the couple we sold her to), however we only ever used 2 gas rings for our cooking. There was no externally accessible storage for outside chairs, electricity cable, water hoses, chocks etc. All of the storage was accessed in the habitation which could be a little difficult if things got wet or dirty. We did make it work - everything had a stowaway cover or bag. The previous owners had fitted a Fiamma Ultra-Box to solve this problem - it's just we took this off so that we could use the bike rack. The overcab bed meant we didn't have to build the bed every day and in contrast to other fixed bed layouts, its foldaway nature enhanced the day living space however it took a while to get used to sleeping with little headroom. There was enough (and good ventilation with 3 windows) not to make it feel claustrophobic but we would have liked to be able to sit up in bed and read at night (which was possible when we built the downstairs bed). Also the overcab mattress wasn't the most comfortable padding for very long trips (just 5cm deep), even with the additional memory foam mattress topper we bought (extra 2cm). It would have been fine for shorter trips and we could have maybe solved this problem by having another mattress / foam piece cut. When we did build the downstairs bed it was much more comfortable due to the thickness of the cushions but after a long day we rarely felt like rearranging and building it. The dining area was a slightly awkward for mealtimes due to the spacing between the sideways bench and the driver seat when it was turned around being a little too far apart. Whilst we enjoyed the extra space of a coachbuilt motorhome, we did feel at times it stopped us from overnighting in certain areas because it's big white nature made it too conspicuous for wild camping. Although we were relatively happy with 27mpg (which we calculated for our Autocruise Starfire 4-berth) a more streamlined vehicle would have been more efficient. Compared to some tourers we preferred to cover less miles and explore the places we visited for longer, so this wasn't a major issue but we were aware that this could have significantly increased our fuel costs on a longer distance adventure. We were really happy with the performance of the Peugeot 2L HDi engine and it drove well on most roads but it wasn't quite powerful enough for the steep mountains roads or on long drag climbs. We often found ourselves crawling in 2nd gear by the end. What we'd change if we'd kept this motorhome longer? Being a 2004 model, even though Autocruise had added several of advanced features like the electric skylight and digital TV receiver etc, LED lighting wasn't fitted as standard. If we'd kept her for another adventure we'd probably have switched to LED light fittings to reduce our power consumption. Also, although we had a relatively low power requirement, we did have a few experiences of running low on power while camping off mains power and without driving after 5-7days (we had one standard 110Ah leisure battery). We were considering have a solar panel or second leisure battery fitted. Why we have sold this motorhome? Our Autocruise Starfire "Homer" was just perfect for us during our first two adventures and we have had many happy memories in her so it was a difficult decision to sell. However, the reason we sold our Starfire is that we began to feel that even if we spent the money making the above mentioned modifications, that our travel preferences had evolved. As we wrote about above and in our series on buying our first motorhome, when we bought Homer we just prioritised finding a good deal. We didn't know how long we'd be motorhoming for and had also read that people go through several motorhomes before they find the 'right' one for them so we worried less about the exact features and layout and more about getting value for our money. We don't regret this approach because we had so little time to search for a motorhome and we knew so little about what we might need / prefer anyway. Besides, our strategy has worked out really well for us - the motorhome we bought was very reliable and a good deal - it held its value, required very few repairs and took us everywhere we wanted to go. It was the 'right' one for us over the past 2 years. However now that our travel style and preferences have evolved (we want to try longer distance and more wild camping for example) the little things that we came to want to change or had overlooked in our first 2 years in the Autocruise Starfire started to build up but more than that we would like to now try a van conversion. That is why we've taken the opportunity whilst we were in the UK to change our motorhome - and it all happened rather quickly! What we are looking for in our next motorhome? Now that we have 2 years of experience touring in a motorhome and having seen many other features and layouts etc. we now feel we have a clearer idea about what would suit our upcoming travel plans for 2016. Potentially a left hand drive as we spend a lot of outside of the UK although that might change so we aren't too worried about this as we didn't feel a right-hand drive has impacted on our experience so far. 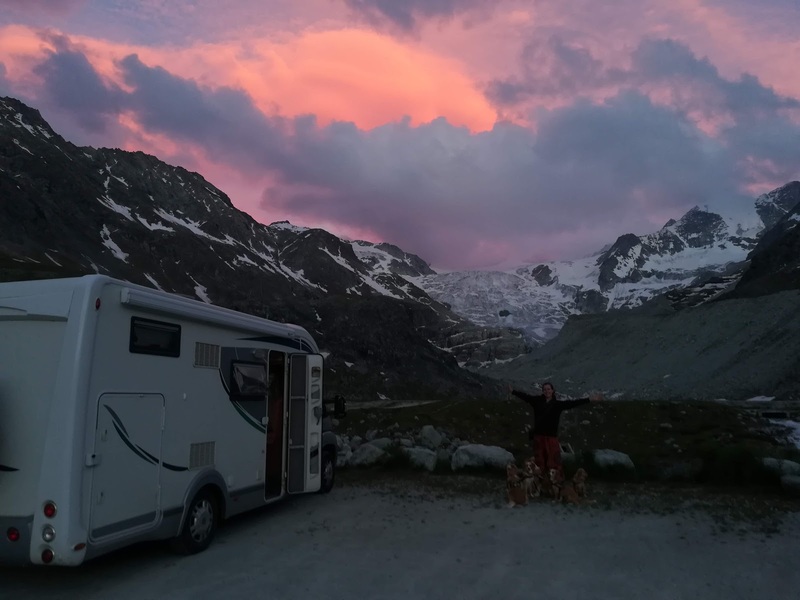 During our 2 years of adventures so far we've had the opportunity to look at and spend time in lots of other motorhomes and until very recently we never considered changing our Autocruise Starfire for a moment. Whenever we got back into our Autocruise Starfire after looking at or spending an evening in other peoples' motorhomes we were always were extremely satisfied with the large living space we had in such a compact size. We enjoyed having a ready-made bed every night that we could foldaway during the day so that we had a rolling living/kitchen area the rest of the time as opposed to some motorhomes which to us felt like a rolling bedroom. After our health scares, we needed the space for relaxing and recovery. The big kitchen area allowed to rediscover the joys of cooking from scratch again. Not only was this motorhome a great deal for us and had good service history - they layout and features all fitted our needs at the time. The reliability, quality and the finish of our Autocruise Starfire was especially impressive and luxurious. If we ever do decide to return to a compact coachbuilt, I don't think we'd hesitate if an Autocruise Starfire was available again (we even asked the people who bought Homer to let us know if they ever considered selling her just in case we're looking - they said they'd give us first refusal but we'd be waiting a long time!). Bye Bye Homer?? Motorhome Adventurers Without A Motorhome!